This info includes Fire, Carpenter, Acrobat, Pharaoh, Crazy, Odorous, Rover, and Leaf-cutting ants. Ants can be a challenge to identify without the proper equipment and experience. 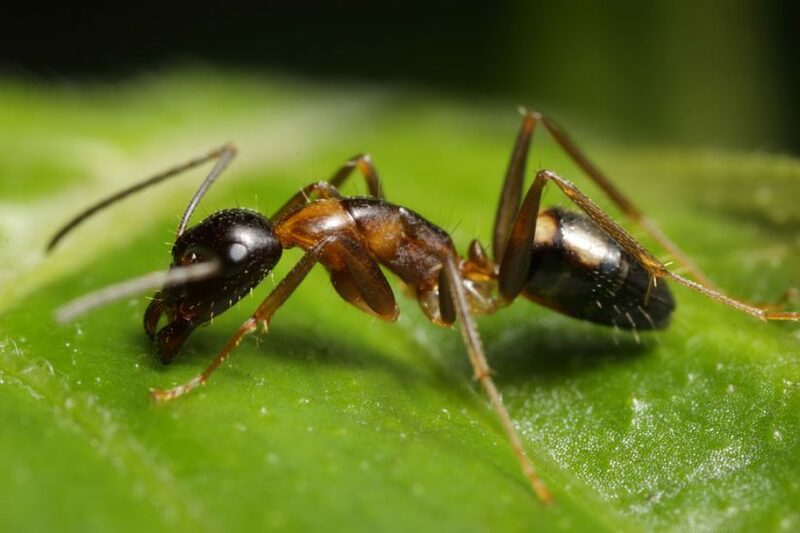 In many cases, the best way to confirm the identity of an ant is to enlist the help of a pest management professional. 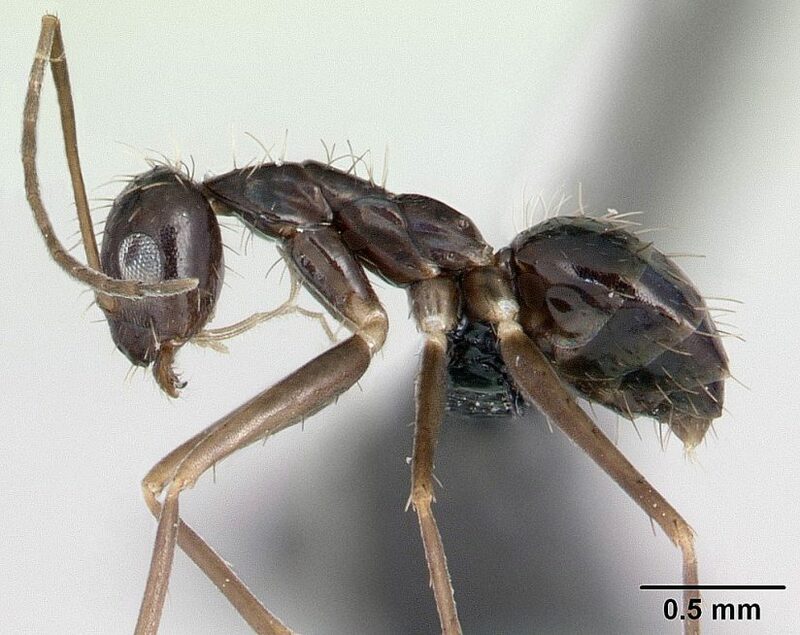 Nevertheless, it is possible to identify some of the most common species of household ants without a microscope. The following pictures and descriptions can be used to help you identify some of the most common Texas ant species. Once you know the species of ant in your home, you can determine where it is likely to nest, what kind of damage it causes, and what kind of control measures are most effective. Red imported fire ants, Solenopsis invicta. 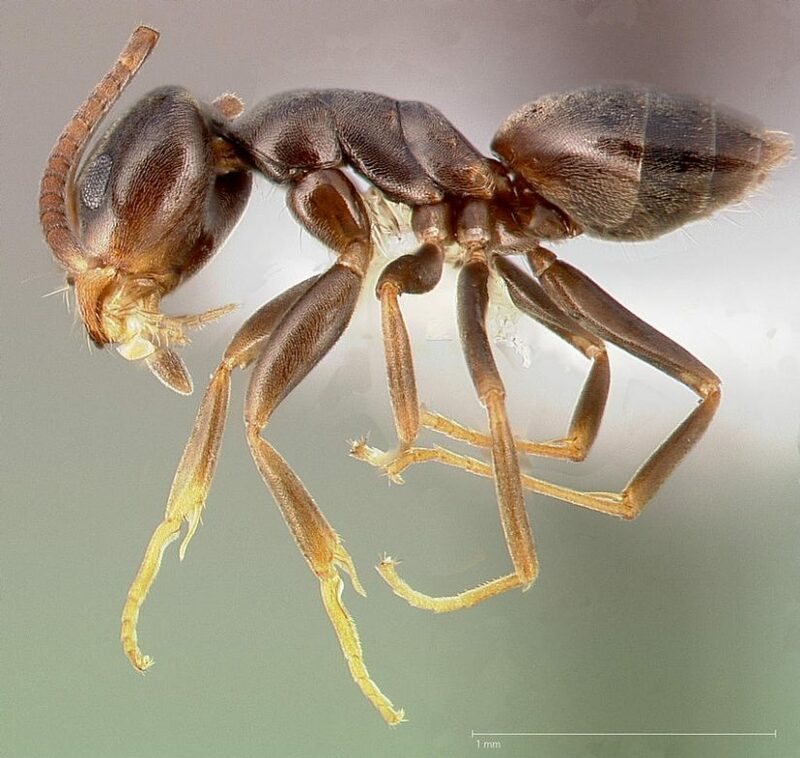 One of the most common ant species in eastern Texas and throughout the southeastern U.S. , fire ants can be identified by their reddish-brown coloration, double pedicel, and by the variability in size of the workers. In addition, fire ants make conspicuous mounds with no visible entrance holes on the mound itself. One of the most characteristic behaviors of the fire ant, however, is its aggressive response to nest disturbance including a vigorous and painful sting. Fire ants almost always nest outdoors, although they will enter buildings in search of food and water, especially in late summer. Carpenter ants, Campanotus species. 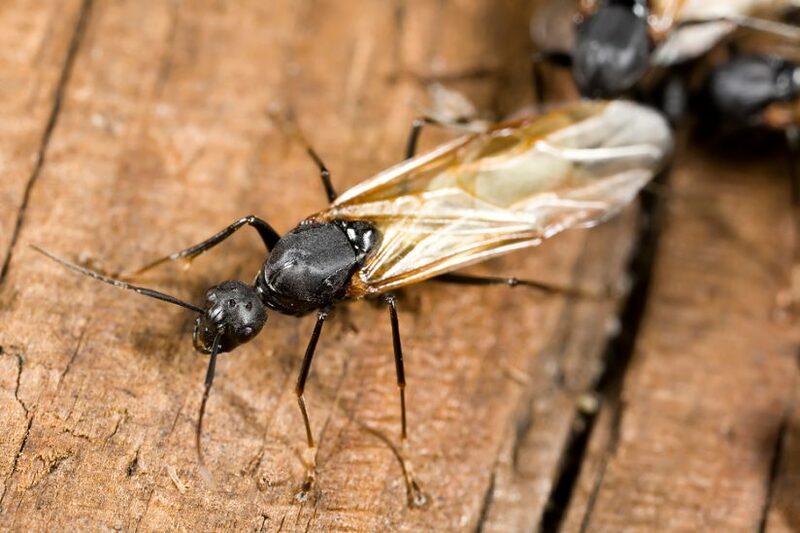 Carpenter ants are generally large, and may be solid black, brown, or a combination of black and orange. Workers are variable in size, have a single pedicel, and a smooth, curved thorax in profile. Carpenter ants are mostly nocturnal, coming out at night to follow trails along fences, tree limbs, water hoses or other linear objects. They do not sting, but can bite. They nest in hollow trunks and branches of trees, but will also make their homes in hollow doors, boxes, and the walls and ceilings of buildings. Acrobat ants, Crematogaster species. These medium-sized ants are frequently confused with carpenter ants because of similar coloration and nesting habits. 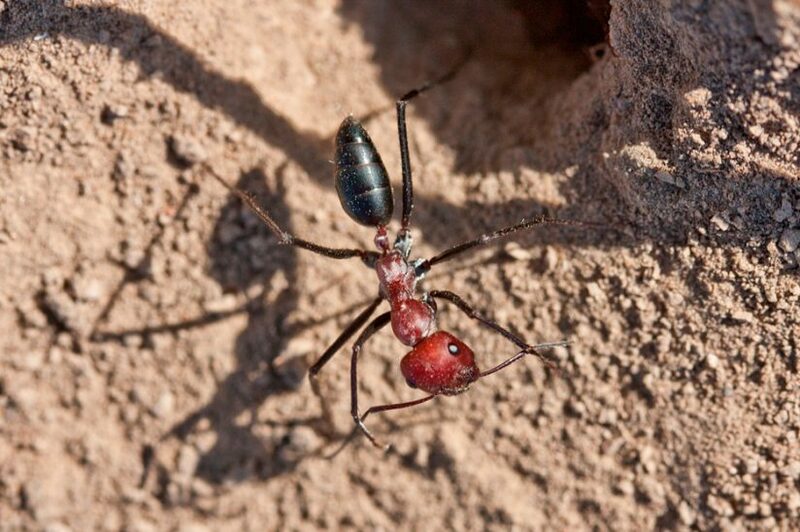 Upon close inspection, however, acrobat ants are quite distinct from carpenter ants. 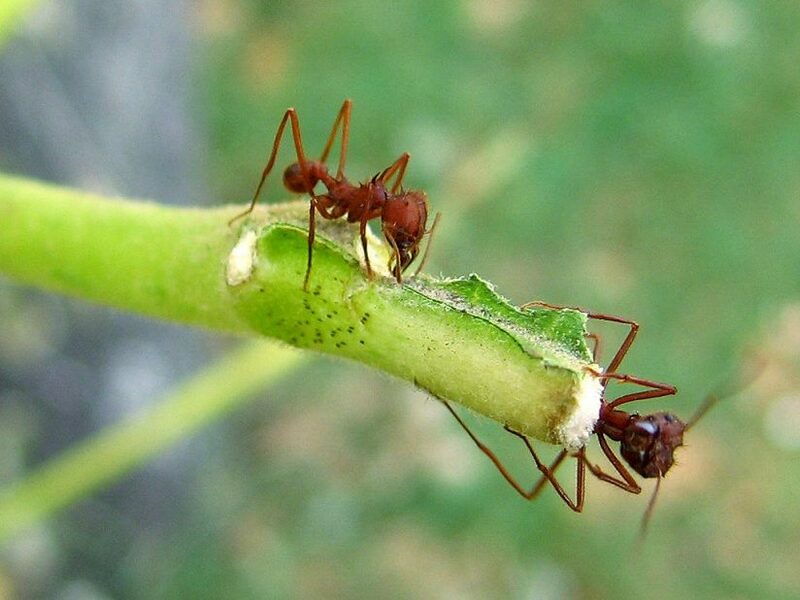 Acrobat ants have two pedicels, workers are all the same size, and they have two spines on the thorax. Unlike carpenter ants, they are mostly active during the day. When disturbed, acrobat ants lift their distinctive, heart-shaped gasters into the air as a defensive posture, much like an acrobat might balance on her hands. Acrobat ants most commonly nest in trees, but will also make their homes in the walls and insulation of structures. 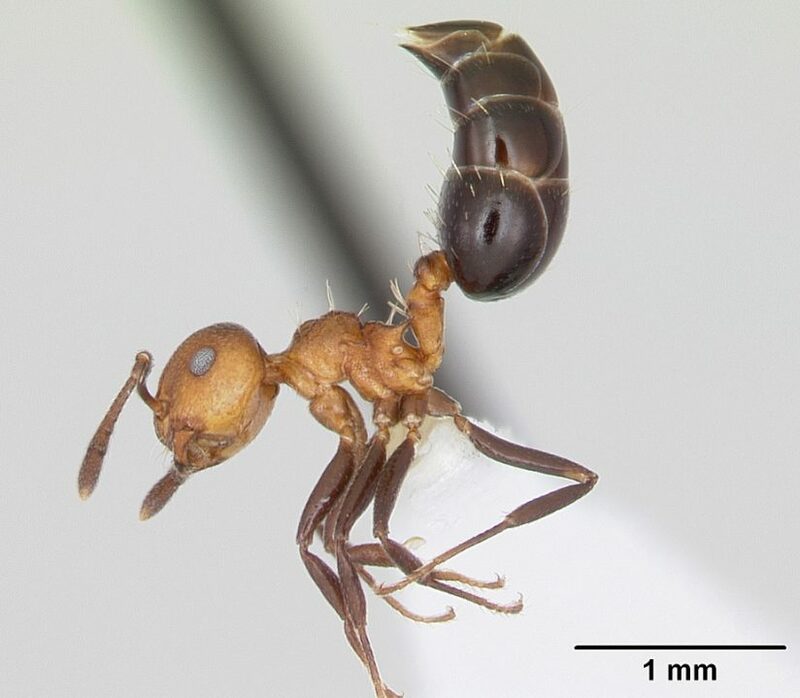 Pharaoh ants, Monomorium pharaonis. These are tiny ants (1/32 inch-long) that frequently nest and live indoors. They are yellowish in color with a dark-tipped gaster. They have two pedicels and all workers are the same size. They make their nests in any dark, narrow space and may be found nesting in cardboard boxes, electrical boxes, in wall voids, etc. 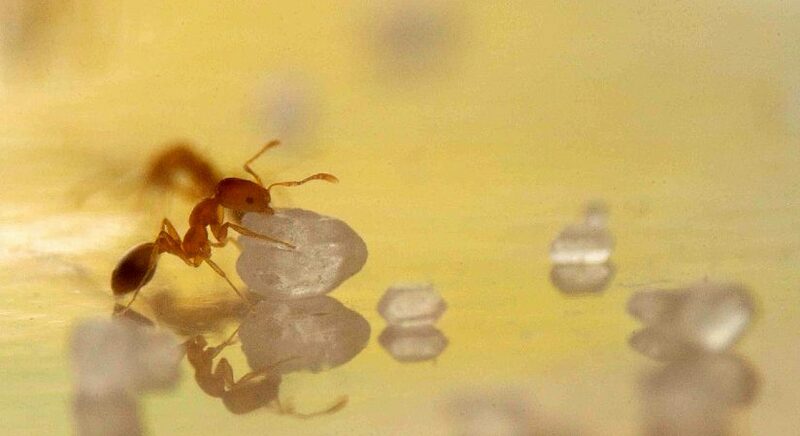 Pharaoh ants are picky eaters, but alternatively feed on foods high in sugars and proteins. Specially designed pharaoh ant baits are usually necessary for good control. Crazy ants, Paratrechina and Nylanderia species. Crazy ants are famous for their fast, erratic running behavior. The most common crazy ant in east and south Texas is the true crazy ant, Paratrechina longicornis. This dark brown ant has long legs and antennae, is extremely fast moving. It commonly infests buildings, especially in the warmer, more humid parts of the state. Upon close examination crazy ants are covered with bristles. A new, exotic species of crazy ant, in the genus Nylanderia, has recently become established around the Houston, TX area. It promises to become an important pest of homes in areas where it is introduced. Crazy ants nest in a variety of locations indoors and out. Indoors, look for nests in the soil of potted plants. Odorous house ant, Tapinoma sessile. Odorous house ant is a common ant that makes its nests outdoors under mulch, stones, and inside and under other objects. They are medium-sized, with a single pedicel that is hidden from above and difficult to see. They are smooth bodied with relatively few hairs, and produce a distinctive, licorice-like, smell when crushed. They are attracted to sweets. Odorous house ants most commonly nest outdoors, but will also nest in bricks and wall voids and other interior locations. Rover ant, Brachymyrmex patagonicus. This is a relatively new pest in Texas. 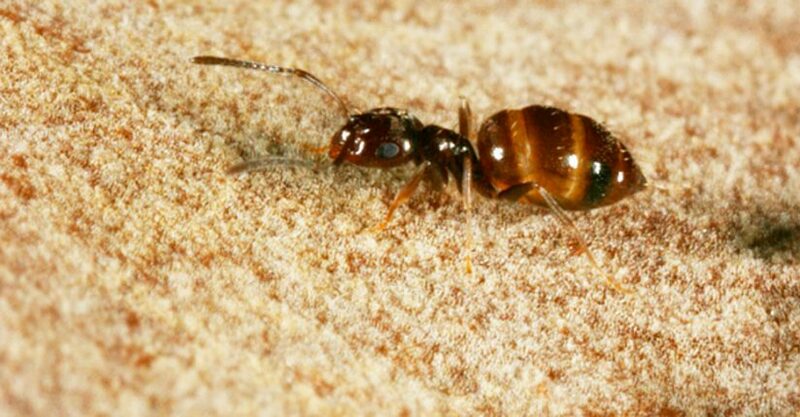 These are tiny ants, similar in size to the Pharaoh ant, but stocky and darker brown in color. All workers are the same size. They are frequently seen along sidewalk and house edges, on the trunks of trees and in a variety of outdoor locations. They do not sting, but will enter homes where they are attracted to sweet foods. Like odorous house ants, they nest in the ground; but colonies will thrive in a variety of locations including the walls of structures. Leaf-cutting ant, Atta texanus. This large ant is easily identified by its distinctive nest and leaf-carrying behavior. Leaf cutter ants live outdoors in the soil. The mounds constructed by the ants are crater-shaped and usually clustered together in a “town”. The ants carry freshly cut and dried leaves and other plant material to the large, subterranean nest. These materials are carefully placed into special “gardens” on which they grow a special kind of fungus, which is eaten by the ants. Worker ants vary in size and are reddish-brown in color. They have long legs and three sets of spines on the thorax, spines on the head, and a smooth gaster. They rarely enter homes but can be common in urban backyards, especially in eastern third of the state and in the central hill country of Texas.